Last friday we watched "What happens in Vegas" starring Cameron Diaz and Supah papalicious Ashton Kutcher its a romantic comedy film were Joy (cameron) is expecting a marriage proposal from her live-in boyfriend but he dumps her, Joy heads to vegas to forget her troubles and discovers her fun. Unfortunately , she wakes up with recently unemployed Jack (ashton) as her husband. 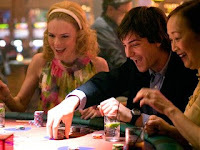 The two quickly decide to divorce, but the plot thickens when jack wins a $3 million slot jackpot using joy's quarter. Since neither one of them wants to give up the cash, they each try to drive the other to file for divorce and give up the bounty. But love has a funny way of appering when you least expect it. I really like this kind of Movie a romantic comedy that will surely make you smile. Cameron and Ashton look good together.Ashton is so gorgeous and appealing. Then yesterday we watched 21 starring Kevin Spacey and Lawrence Fishburne (he looks like keanu ribbs) it is a lifeless adaptation of the acclaimed true life novel "Bringing Down the House" which recounts the adventures of a group of MIT students who took on to las Vegas. The story is all about Ben (Jim) a brilliant yet socially awkward MIT student who has aspiration to attend Harvard Medical school but he cannot afford the tuition fee. Micky (Kevin) who is a math professor who recruits Ben to be a part of his card counting scheme to make millions from playing the blackjack tables in Las Vegas. He accept the offer of Micky to save money for his tuition in Harvard but unfortunately there always a conflict in any movie. I dont know how to play black jack so its hard for me to understand how they counting the cards anyway its pretty entertaining to me. friends dont forget to watch Kung-fu panda this coming friday june 6 2008.